The widespread use and popularity of paving patterns dates back centuries. Starting with the Romans, who experimented with and pioneered various paving designs spanning thousands of mosaic and cobbled paths and roads, these earliest paving patterns and designs can still be seen in ancient cities around the world today. Of course, these early paving patterns were basic and crude, matching the limited tools the medieval builder had to work with. Today, paving designs are modern, intricate and sophisticated, and the range of paving patterns and designs that modern builders can work with are vast because high quality modern pavers can be easily and meticulously cut and shaped. Now, a well-established range of modern paving patterns can be a key to bringing your garden landscape to life. 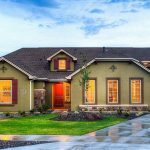 But before you put your own elbow grease or hire a great landscaper to work at your place, let’s take a closer look at some of the various paving designs you can choose from. So let’s take a closer look at these paving patterns and designs, considering what makes them popular and how to best implement them in your garden paradise with some simple builder’s tips. Herringbone is particularly popular among the top paving patterns, because the pavers are arranged to interlock and therefore support themselves. Paving tip: The cut edges do have a tendency to separate, so opposing straight rows or a ‘header’ are recommended. While stack bond paving patterns can be among the most challenging to implement, it remains one of the most popular. That’s because, if done skilfully, stack bond driveways can be nothing short of spectacular. Paving tip: To implement stable and spectacular stack bone paving designs, the bricks should be tapped gently together with a rubber mallet – – preventing the rows from wandering – and secured with a hard concrete edge or header row. 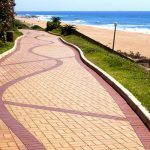 If you’re browsing the ideal paving patterns for your winding garden path, you may settle on the stretcher bond paving designs. You will recognise the stretcher bond paving patterns and designs from normal housing brickwork, but it’s actually perfect for curves because the paving patterns can flex. Paving tip: Unless you’re using interlocking bricks, you will need to pay particular attention to the separation of the rows of bricks so the grouted gaps stay aligned. Like stretcher bond paving patterns, you’ll need a secure concrete edging. Basket weave is another of the most challenging paving patterns and designs, but when done correctly, the results are spectacular. 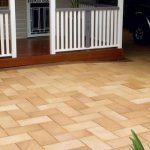 Among the best deployments of basket weave paving patterns are for patios and entertaining areas. Paving tip: Putting down basket weave paving patterns can be a little more time consuming because of all the colour and direction changing. However, it’s perfect when you’re using second-hand bricks because the eye is drawn away from their imperfections. If you really want to turn heads with your paving patterns and designs, you can’t go past circular/radius solutions – especially these days when natural shapes are particularly trendy in the garden. But while the finished product is the most rewarding, this is the paving pattern that is the most challenging to plan and lay. Paving tip: Those who are best at pulling off great-looking circular designs report that the paving patterns should be attacked from the centre. By working outwards, you’ve already taken care of the fiddly bits in the middle rather than having to make it work at the end. Of course, while all those perfectly-implemented paving patterns and designs can look great and be executed skilfully, sometimes it’s the more natural random paving patterns that can look best. That’s not to say there isn’t lots of planning involved – in fact, these patterns can be the most time-consuming. But when contrasted with the straight lines of timber decking, more random paving patterns can really bring your garden paradise to life. Paving tip: The best pavers for these patterns are randomly shaped, such as natural slate stone. 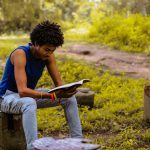 It’s almost inevitable that at some point in your garden lifestyle adventures, you’ll be browsing among these popular paving patterns and designs. Paving is a perfect way to add interest, style and function to your outdoor life. Choose from the range of colours and different types of pavers for your dream paving is the next step in your paving adventure!